The need for tax reform is clear. Economic growth has been sluggish for a number of years, workforce participation is down, wages are stagnant, and the U.S. tax code is increasingly out of step with those of our major trading partners. A number of presidential candidates and members of Congress have presented big ideas to overhaul our outdated tax code. Some policymakers are talking about flat taxes, value-added taxes, cash-flow taxes, or hybrid reform plans. Many of these plans move toward a simple principle: they tax each dollar of income one time, which makes them neutral between the decision to spend a dollar today or save and invest a dollar to spend tomorrow. This is important because one of this biggest problems with the current tax code is that a dollar of income can face up to four layers of taxation when all is said and done: 1) it’s taxed when you earn it and pay an income tax; 2) it’s taxed when a business you invest in earns a profit and pays a business income tax; 3) it’s taxed when you realize returns to investment and pay taxes on capital gains and dividends; and 4) it’s taxed when you pass away or give it as a gift through estate and gift taxes. A neutral tax system would tax each dollar of income once and only once. Whether we start from scratch or make changes within the confines of the current tax code, all tax reform plans should aim for that goal of neutrality. The good news is that there are ways that we can fix the current tax to make it neutral. The current corporate tax rate of 39.1 percent (35 percent federal, 4.1 percent state average) is the highest in the developed world and third highest in the entire world – behind only Chad and the United Arab Emirates. 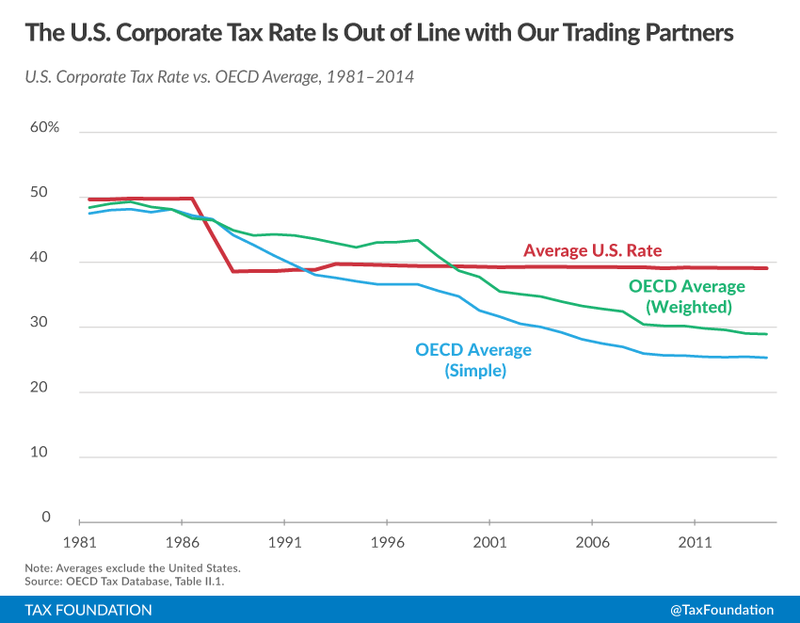 Over the last 25 years, lawmakers in the 34 OECD countries have cut their corporate tax rates while our rate has remained virtually unchanged. In recent year, the United Kingdom, Canada, Japan, and Sweden have all cut their corporate tax rates. The high corporate tax rate makes U.S. corporations uncompetitive internationally and deters investment at home and abroad. But corporations aren’t the only businesses that face high tax rates in the United States. Pass-through businesses – business in which the owners pay taxes on their individual tax returns – pay marginal tax rates above 50 percent in some states. These businesses make up 95 percent of all businesses in the U.S., earn over half of all business income, and employ 55 percent of all private sector employees. Tax reform should lower the tax rate on both types of businesses in the United States. Former President Bill Clinton has said that when he was president he told his advisors, “don’t go above the average rate of OECD countries.” A corporate tax rate of close to 20 percent at the federal level (plus an average of 4 to 5 percent at the state level) would put us close to the simple average among the developed countries of about 25 percent. A federal corporate rate of 25 percent (about 29 percent with average state taxes) would put us close to the OECD weighted average of 29 percent. The U.S. is one of six OECD countries that taxes corporate income on a worldwide basis. This means that no matter where in the world a U.S. corporation earns income, it is liable for taxes at a rate of at least the federal corporate tax rate of 35 percent when that money is brought back to the United States. This treatment put U.S. businesses at a competitive disadvantage when competing in foreign countries. For example, when a U.S. business competes with a French business anywhere in the world, the U.S. business faces an additional tax when that money is brought home. The result is that many U.S. corporations hold and reinvest money overseas or simply move their headquarters to a country with a better tax system. The U.S. should join the rest of the developed world and move to a territorial tax system – a system where corporate income is only taxed in the country in which it is earned. Since 1990, 19 OECD countries have moved from a worldwide system to a territorial system, leaving the U.S. as one of six OECD countries with a worldwide tax system. A shift to a territorial tax system would eliminate the many of the competitive disadvantages that U.S. corporations face on the international stage. Businesses and economists measure profit as revenue minus costs. For example, let’s say you own a pizza shop. You purchase an oven for $30,000 and use it to make 16,000 slices of pizza, which you sell for $2.50 and revenue of $40,000. Ignoring labor costs and rent, your profit is your revenue ($40,000 in pizza sales) minus costs ($30,000 in oven purchases), or $10,000. Unfortunately, that’s not how the tax code looks at it. Currently when a business invests in capital equipment – it buys a pizza oven or builds a factory or purchases a shopping mall – the tax code requires that business to write off, or deduct, the cost of that investment over a number of years and sometimes. Current cost recovery rules incorrectly define business income. Due to the time value of money and inflation, a business is not being able to claim the full cost of their investment. If you have to write-off the oven for your pizza shop over ten years, your $3,000 deduction against revenue will be far less valuable in real dollars in ten years than it is today. This treatment understates business costs and overstates business profits. This means that some businesses pay taxes on profits that don’t exist. In fact, our pizza shop owner is paying taxes on $37,000 of income in year one, $27,000 of which doesn’t exist. In the U.S., businesses are only able to deduct an average of 62.4 percent across all types of capital investments. 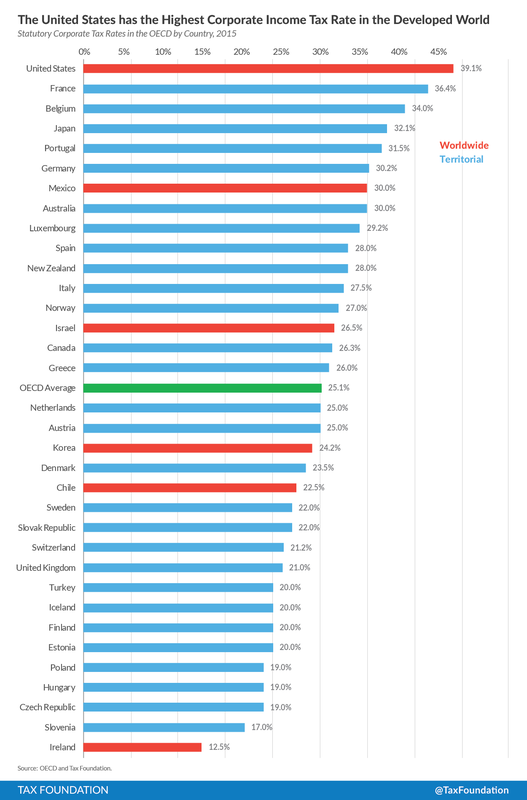 This places the U.S. in the bottom third in OECD. Full expensing would allow businesses to deduct the full cost of an investment in the year in which it is purchased. This would define business income the way that businesses define it—on a cash-flow basis. This means the tax code would correctly define business income as revenue minus costs. Full expensing would provide a large boost to capital investment in the United States and provide a significant benefit to workers in capital intensive industries, such as manufacturing, mining, and agriculture. This is because projects that were previously unprofitable would become profitable because businesses would no longer have to pay tax on their investments. According to the Taxes and Growth model, full expensing would grow the economy by over 5.4 percent, boost wages by over 4.5 percent, and create nearly 1 million jobs. The current tax code has two layers of taxation on corporate income: the first is at the corporate level in the form of a corporate income tax and the second is at the shareholder level in the form of a capital gains or dividend tax. This double taxation creates a high tax on corporate investment. For example, let’s assume a corporation earns a $100 in income. That corporation first pay the combined federal and state corporate tax rate of 39.1 percent. That leaves the corporation with $60.90 in income to distribute to shareholders. If the corporation distributes this income, the shareholder pays a combined federal and state top dividend tax rate of 28.7 percent. The results is a total tax bill of $56.57 and after tax income of $43.43 on $100 in pre-tax income. 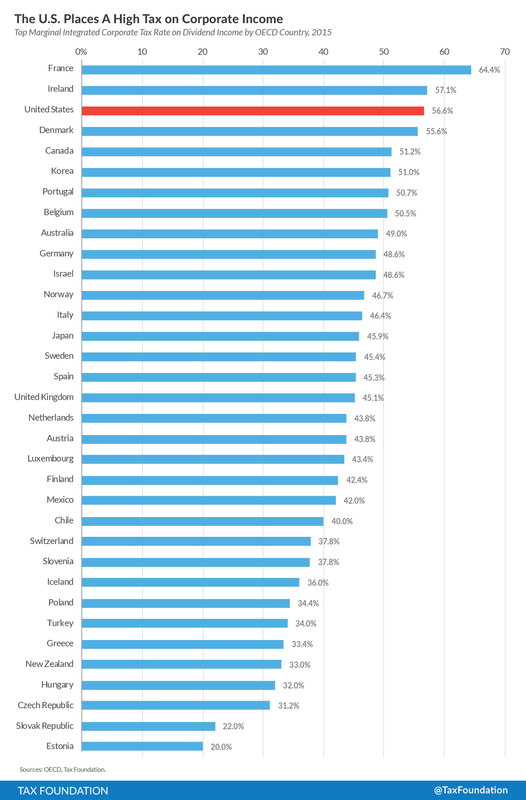 This 56.6 percent integrated corporate tax rate is the third highest in the OECD, behind only France and Ireland. Tax reform should eliminate this double taxation of corporate income and bring down the tax rate on corporate income. There are a number of ways to integrate the corporate and individual tax codes. The easiest option would be to eliminate either the tax on corporate income at the business level (the corporate income tax) or the shareholder level (the dividend tax). Estonia, for example, taxes corporate income at a 21 percent rate when it is distributed to shareholders and then taxes capital gains at 21 percent to capture the value of retained earnings. Other options to eliminate the double tax of corporate income include dividend deduction or credit systems. A second reason for corporate integration is to give all businesses equal tax treatment. Under the current system, pass-through businesses and C corporations face different tax rates. While corporate income faces tax at the entity and shareholder level, pass-through business income is passed to the shareholder’s tax return where he or she pays the tax. The solution is to tax all business income one time. The easiest fix might be to tax all business income (i.e. distributed profits and capital gains) at the shareholder level. To ensure equal treatment of businesses, this would require no tax at the corporate level and parity between the tax rate on wage income and capital gains and dividend income, preferably at a rate competitive with the OECD. Even with all these other changes, there still remains a double tax on much of the income that we save. This is due to the capital gains tax. When we save for our future, we buy assets such as stocks and bonds with after tax income. When these assets increase in value and we experience, or realize, a gain, the current tax code requires a second tax. This discourages saving, which limits the money available for investment in the economy. Now, let's look at the treatment under the current system, but we'll still use 10 percent tax rates to keep life simple. When we earn our $100, we first pay a 10 percent tax on our income. This decreases our income to $90. We then invest that $90 and earn a 10 percent return (a $9 gain), which leaves us with $99. If we stopped here we would be fine, but we don't. We then pay an additional 10 percent tax on our capital gain of $9, which leaves us with a gain of $8.10 and final income of $98.10. This lower return discourages saving. Fortunately, the current tax code provides a partial fix for double taxation through retirement accounts. Traditional IRAs and Roth IRAs provide taxpayers with the one layer of tax in the ideal treatment we discussed above. However, these accounts come with caps on the amount a person can save and penalties if a person wants to use the income before they turn 60 to buy a house or pay for their child's college tuition. Universal savings accounts would fix this issue. These savings accounts would provide ideal tax treatment, but for all savings. They would allow people to save for the variable costs in life without discouraging that savings with double taxation. Canada and the United Kingdom are two countries that have introduced universal savings accounts with much success. The U.S. has the fourth highest estate tax in the OECD at 40 percent. Yet, even with its high rate, the estate tax raises little revenue for the federal government. Due to an increasing exemption, a small number of estates actually pay the estate tax. Despite only a small number of estates actually paying the tax, many estates and family businesses face administrative costs associated with planning around the tax and the economy experiences lost investment due to the tax. At its core, the purpose of a tax is to raise revenue to fund government functions and an efficient tax minimizes the economic harm in the process. The estate tax fails on both counts. Many countries have recognized this and have begun to move away from the estate tax. Since 2000, seven OECD countries have repealed their estate tax and in total, 15 of the 34 OECD countries now go without an estate tax or inheritance tax. Following the example of the rest of the developed world would be wise in this case. Estate tax repeal would eliminate the final additional layer of taxation and bring us to a neutral system. Sound tax policy is the pursuit of a tax system that raises revenue in the least destructive manner possible. By this measure, the current tax system fails. It double, triple, and quadruple taxes. It incorrectly defines business income. And it levies tax rates that are uncompetitive by international standards. These six changes would fix all the major issues with the current tax code. Corporate integration, universal savings accounts, and estate tax repeal would eliminate the multiple layers of taxation, yet still ensure that every dollar of income is taxed once, but only one. Allowing businesses to fully expense capital investment would correctly define business income as revenue minus costs and eliminate the current tax on business investment. A lower corporate tax rate and a shift to a territorial tax system would make U.S. businesses competitive on an international scale. Likewise, a lower tax rate on non-corporate businesses would help those businesses invest and grow. The result of these changes would be a pro-growth, neutral tax system that makes the United States competitive, creates jobs and lifts wages for workers across industries, and allows taxpayers to save and invest for the future. This type of tax system would raise living standards for all U.S. taxpayers and that should be the goal of any serious tax reform.